POSCO has earned the world’s most competitive steelmaker title from the annual ranking released by World Steel Dynamics (WSD), a global steel industry research institution. Since 2002 when the annual WSD’s ranking announcement began, POSCO had securely retained first place for three years until 2004. Albeit its slight dip to second place from 2005 to 2009, POSCO has ascended yet again, attaining world’s most competitive steelmaker for the ninth consecutive year since 2010. Despite unsteady rankings of worldwide prominent steelmakers ranging from third to tenth, POSCO’s enduring position as first and second place reflects POSCO’s staunch management and firm commitment amid complicated management conditions over the last 17 years. Based on the 10-point scale, WSD determines each factor with a weigh, and then weighted average in the final stage to pull off the ranking score. 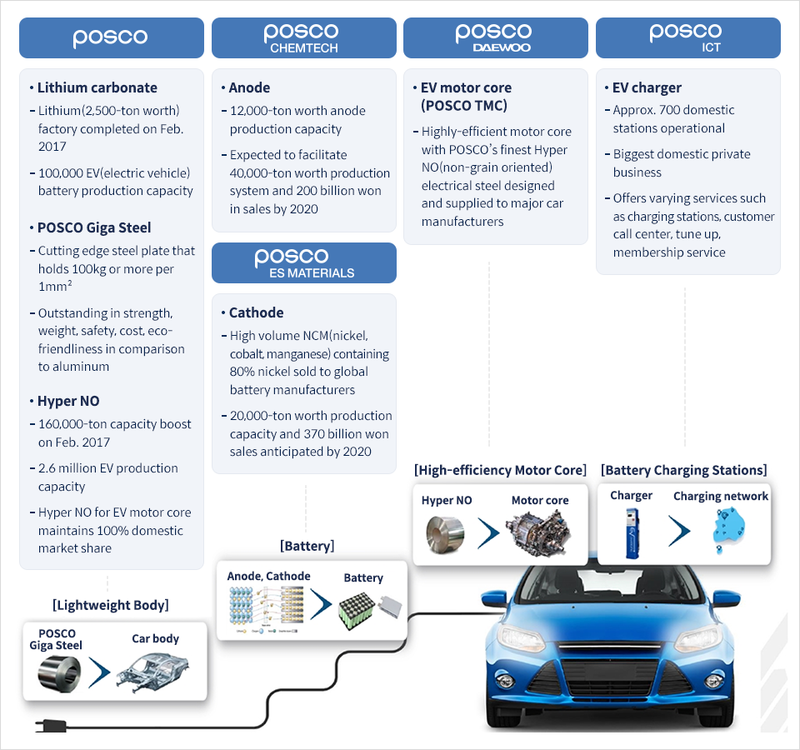 POSCO was first to exceed the 8-point scale average in 2014. Subsequently, landing first place meant reaching from high on the 7-point scale to 8-point scale. POSCO won perfect points in the eight evaluation categories including cost-cutting efforts, harnessing tech revolution, downstream business, and skilled & productive workers. 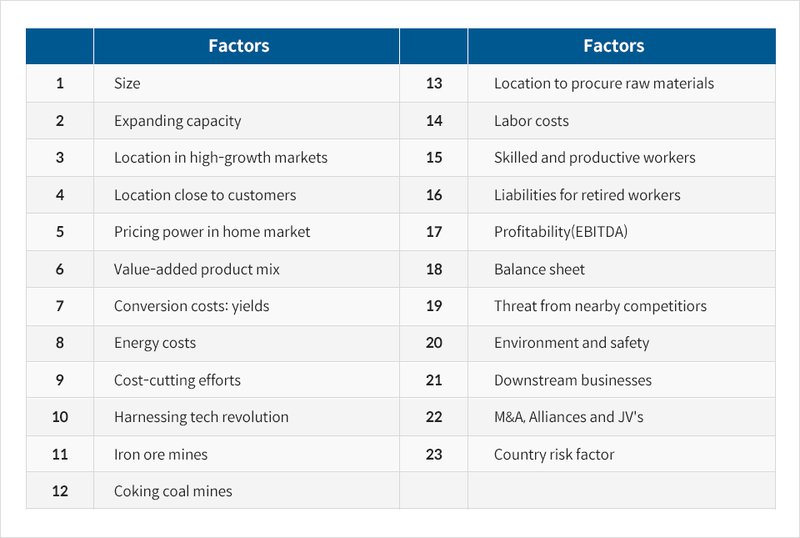 High scores were received in pricing power in the home market, profitability, size, and expanding capacity categories. POSCO has undergone about 150 intensive restructuring for three years since 2014, achieving close to 6.3 billion US dollars (7 trillion won) in cumulative financial improvement. And the company’s earnings at both its domestic and overseas subsidiaries have turned into surpluses, laying a steady foundation for future prospects. In like manner, profit continues to grow as the margin exceeds 7%, and debt ratio remains at the industry’s lowest level of 60%. POSCO’s advancement in the 4th Industrial Revolution is highly anticipated with expanding sales of WP(World Premium) products through adopting Solution Marketing, and in accelerating the completion of total solution business portfolio from vehicle components to networking systems. Moreover, strategies to implement smartization of factories and marketing them as solution package are under way. Having maintained world’s top position withstanding severe recession caused by surplus over the past three to four years, this stance is reflected in this year’s WSD ranking and is expected to continue.